Mega Sale! Free Shipping Included! Save 24% on the Apex Utility Bench Slant Board Sit Up Bench Crunch Board Ab Bench for Toning and Strength Training JD-1.2 by Apex at Strongman Pictures. MPN: JD 1.2. Hurry! Limited time offer. Offer valid only while supplies last. HEAVY-DUTY STEEL CONSTRUCTION - This slant board has a heavy-duty steel tube frame finished with a powder-coated finish that offers reliable resistance against scratches and wear and tear. It offers the durability to support all your workout routines. HIGH-DENSITY PADDED BACKBOARD - With a durable vinyl covering, this product is reinforced with comfortable foam padding to provide users with the right support. Its extra-long board keeps your back in place, reducing the risk of accidents and discomfort. 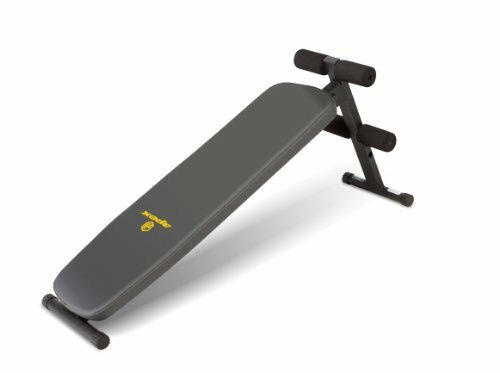 UPPER BODY BUILDER - This slant board is designed to train the upper body with workouts such as sit-ups, crunches, decline bench presses, and leg raises. Make body building more effective and sculpt your arms, abs, core, and legs for a toned physique. ADJUSTABLE ROLLER PADS - This board lets you safely perform exercises with proper form with its four thigh and ankle roller pads. Its conveniently structured to adjustable pads offer precise stabilization for your legs while isolating upper body muscles. QUALITY HOME GYM EQUIPMENT - The premium materials and durable parts used in this equipment makes it the perfect addition to any home gym. This multi-functional exercise equipment comes with a two-year limited warranty for hassle-free usage. If you have any questions about this product by Apex, contact us by completing and submitting the form below. If you are looking for a specif part number, please include it with your message.